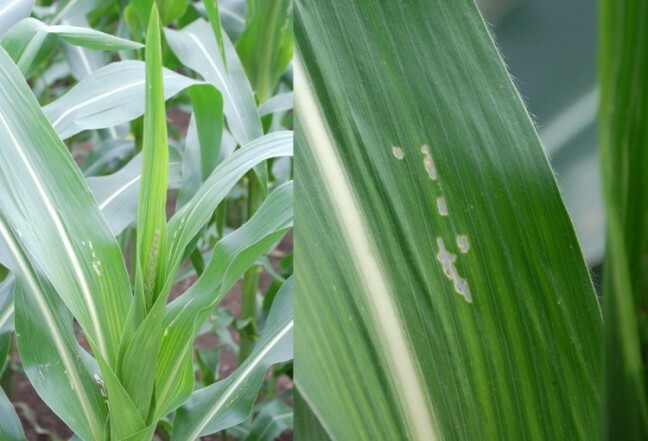 Watch for Increased Insect Activity in Sweet Corn and Pumpkins | Chatham-Kent Agriculture Development | We Grow For the World! In general, insect pressure has been relatively low this year. However, over the past week we have noticed an increase in insect activity. Start scouting for European corn borer at the mid-whorl stage, before the tassel begins to emerge from the plant. Look for flattened, white egg masses on the under surface of the leaves. Newly hatched larvae often hide in the developing tassel during the heat of the day. Window panes, pin-hole feeding and small amounts of saw dust-like frass are all signs of feeding. Optimal control occurs during the early stages of insect development, before the larvae enter the stalk. Young larvae range in colour from almost translucent to yellow to brownish, with a black head. Striped cucumber beetles are usually well-controlled with insecticide seed treatments or in-furrow treatments. However, staggered emergence this year means that these residual controls have worn off before the beetles have fully completed their lifecycle. Beetle feeding on cucurbits is significant. It can transmit bacterial wilt, for which there are no treatments. Scouting is most effective when conducted in the cooler morning hours. If there are flowers present in the field the beetles typically congregate inside the blossoms. The control threshold is 0.5 to 1 beetle per plant. Before applying an insecticide during bloom, refer to the product label for specific measures required to reduce the risk to pollinators. For more information on integrated pest management in cucurbits, see Ontario CropIPM.